I love a routine and any ritual that makes my day more pleasant and calm. 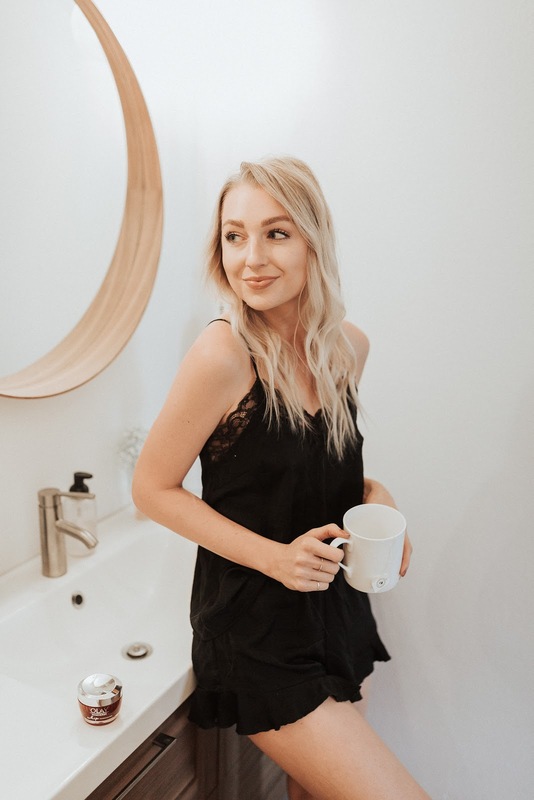 My morning and nighttime routines change up a bit throughout the year and depending on my schedule, but lately I have a calming fall nighttime routine I thought I would share with you today! Keep in mind this usually takes place after a busy night of dinner, clean-up, [sometimes] workout, shower, and a few hours of work on my laptop (either blog work or photo editing), so I need these little rituals to help me slow down at the end of the night. I try to do this year-round, but I especially crave my evening cup of hot tea in the fall and winter. I usually drink peppermint tea later in the evening and/or before bed because it’s really relaxing and promotes healthy digestion. This one is my favorite! I love doing my nighttime skincare routine and find it so relaxing! At night I always apply a good moisturizer + oil at the end of my skincare routine so my skin gets re-hydrated overnight. 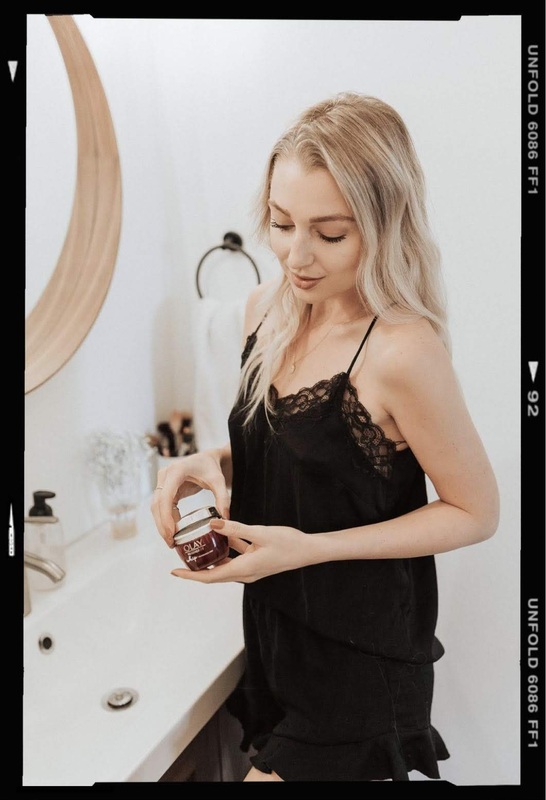 This fall I’ve been using Olay Regenerist Whip Fragrance-Free and my skin is loving it! I wake up dewy, but not oily or greasy due to the lightweight texture, and it makes my skin so soft and smooth. You girls know how sensitive my skin is, so I was so excited when Olay released a fragrance-free version of the Regenerist Whip. It’s definitely lived up to the hype and my skin is glowing now more than ever! And I love that I can pick it up at Walgreens whenever I need to restock it. I keep an essential oil diffuser in our bedroom and love to diffuse oils before we got to bed and while we sleep. 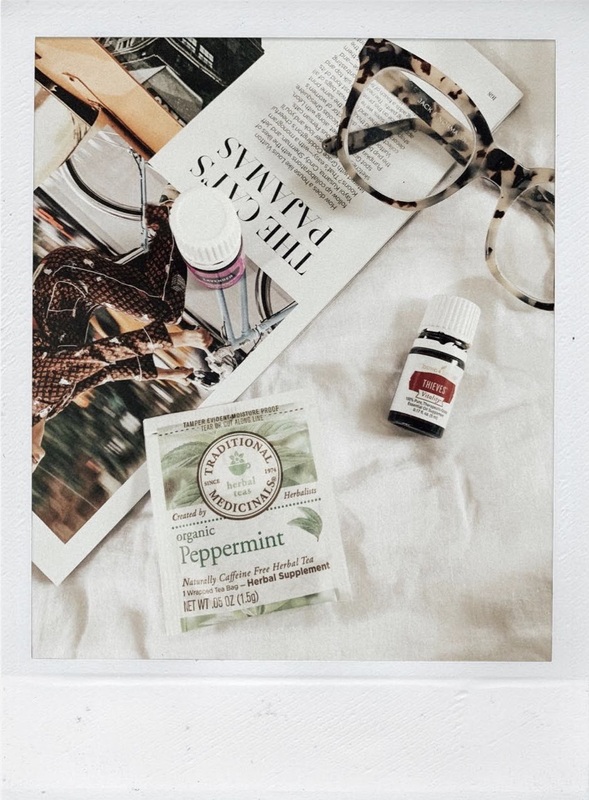 Not only do they give off a lovely aroma and create a calming atmosphere in our bedroom, but essential oils have many health & wellness benefits too. Most of the year my go-to is lavender oil because it calms you and promotes good sleep (and lavender is one of my favorite scents)! Lately I’ve also been diffusing lots of Thieves oil because it is great for the immune system and has a really nice fall/winter scent to it. I know a lot of wellness experts say not to have a TV in the bedroom, but Trey and I love to watch a show in bed as we fall asleep. I think this is one of those things that’s different for everyone! We personally find it super relaxing and usually throw on an episode of Friends, The Office, or That 70’s Show. What are some things you do to wind down before bed? This is a sponsored conversation written by me on behalf of Olay. All opinions and text are my own.